Japan Deluxe Tours handled a very good Japan tour. Enjoyed going on this tour. Japan is a very beautiful with so many great sights to see. Especially enjoyed seeing Takayama. Our tour guide was great, a real wealth of knowledge on every spot. 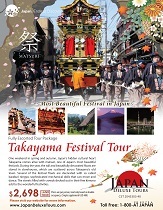 Japan Deluxe Tours handled all the details planning a very good Japan tour. Very personable tour guide, could have given better daily instructions.